If you’ve walked through a department store lately, you may have overwhelmed by the perfume section. Whether you are obsessed with Obsession, a believer in Believe, or consumed by L’Air du Temps, the smell of perfumes and colognes can be overwhelming. The toxic effects of fragrances can also be overwhelming. Some fragrance ingredients disrupt our natural hormonal balance, causing any number of possible emotional concerns, including: anxiety, mood swings, and depression. Feeling down? It could be the scent you’re wearing. 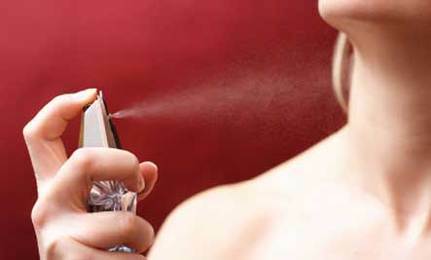 Even if you can’t smell perfumes, you may be suffering ill effects from exposure. Not all scented products were created equally. Commercial brands of perfumes and colognes primarily comprise synthetic chemicals. Even many natural products contain synthetic fragrance ingredients so it’s important to start reading labels on personal care products. If there’s no ingredient list, the manufacturer may have something to hide. Also, beware of “fragrance oils” masquerading as essential oils. The former is synthetic, while the latter are derived from flowers, leaves, and other natural substances. Shakespeare claimed: “that which we call a rose by any other name would smell as sweet.” Thanks to today’s chemical industry, that is no longer true. Worse than that, the potential health effects are anything but sweet. Wonderful article, just disappointed that you left out the fragrances in laundry detergents, and dryer sheets which are some of the worst products and offenders. People need to know how dangerous these are, and how sick they make many people. thank you for the article it is helpful to educate people . It is not at all clear whether all perfumes contain all these toxins. Surely, after all your research, it would be helpful to recommend some perfumes that are safe.